Training Courses in Blacksmithing, Bladesmithing & Metalsmithing. 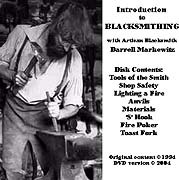 Artisan Blacksmith Darrell Markewitz offers a regular series of weekend long programs in a number of aspects of traditional Blacksmithing. Special courses include : layered steels (pattern welding), bladesmithing / knife making, bronze casting, iron smelting. 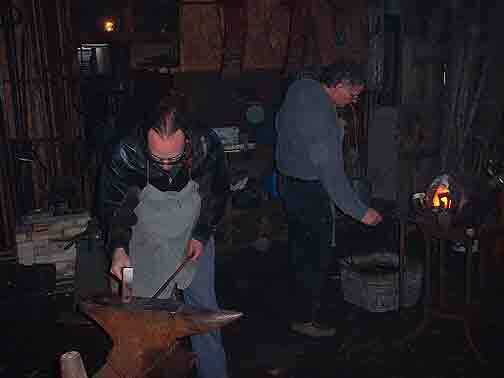 Programs held at the Wareham Forge in Ontario Canada, with remote teaching offered at other facilities. 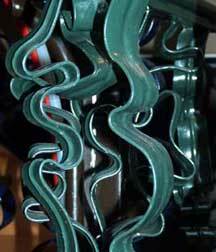 Darrell has been working with forged metals since the late 1970's. After 4 years at Ontario College of Art, he worked as the blacksmith / interpreter at Black Creek Pioneer Village. He now makes his living as an artistic blacksmith and museum consultant. 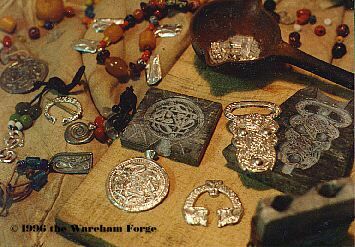 Since 1993 he has held a regular series of workshops at the Wareham Forge - a full slate of basic, intermediate and specialized programs. As well as sessions at folk festivals and special programs at museums and universities, he has trained historic interpreters for museums and living history programs in Canada, the USA and the UK. Darrell provides his decades of experience as an artisan blacksmith, technical instructor, and historic researcher with all his programs. The shop combines traditional and modern equipment. The main forge is coal fired with electric blower. A secondary forges, firing propane, provide additional working areas on the main production floor. There will be one anvil set per student, all basic hand tools and safety equipment will be provided. Powered equipment includes an air hammer, hydraulic press, oxy-propane torches, MIG welders, drill press, grinding and polishing machinery. As well there is a fully equipped fine metals studio available for special programs (includes pewter, bronze and fine metals casting equipments). Outdoors there is a dedicated area (with overhead cover) for iron smelting and related activities. Depending on program - only 4 or 6 students will be accepted for each session. Each student will be provided with work station consisting of mounted anvil and basic hand tools. Two students will share a single forge (coal or propane). The class shares use of power tools. Taken together this means close personal supervision and lots of hands on working time. Programs are open to any physically able people, from young adults onwards. (Aged 16 an up - see a special note : Teens as Students). There are only limited provisions made for students with "learning disabilities", this * is * a group setting. English is the language of instruction. Sorry - the Wareham Forge is not really wheel chair accessible. Please read the description of overall Requirements for Training. Because of increased demand, 'mid season' Basic Level courses will be increased to SIX students. Note that some dates listed remain * tentative * at this point! All may save Time *before* you contact me! This is an 18 hour program that stresses a hands on approach, with a Friday evening lecture and two full working days in the forge. No previous metalworking experience is required. The Friday session will cover the world and work of the blacksmith - and how to purchase an anvil. Two days hands on work will introduce the student to the forge and its basic tools, and the correct way to use the hammer. Individual forging processes are learned through each student completing a number of specific projects they keep. Only six students per session, each with their own work station, means close personal attention. Projects include poker, hooks, and several small decorative items. Course fee of $425 (+HST) includes materials / handout / safety wear. All Intermediate level programs have previous experience \ skill requirements. This two day, 16 hour session will introduce the student to the basic techniques required to produce simple hand forged knives. 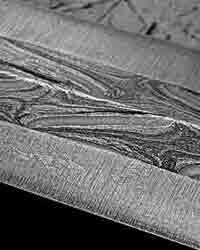 Covers: historic patterns, alloys, heat treating, forging shapes, basic finishing & hilting. 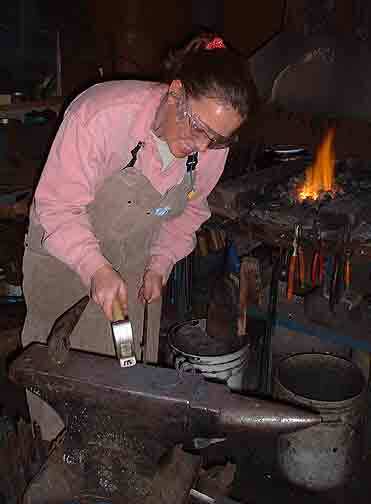 Each student will forge and work to finish a small belt knife, plus rough forge a number of basic blade shapes. Requires 'basic' level experience, (ability to assess temperatures and basic hammer control). Course fee of $425 (+HST) includes materials and handout. Session limited to four students. For more details on this special program - go to Bladesmithing Course. NOTE: Possible major project work in Europe may pre-empt this program! Check back later for bookings. Those looking for a quick 'Forge to Blade' program? 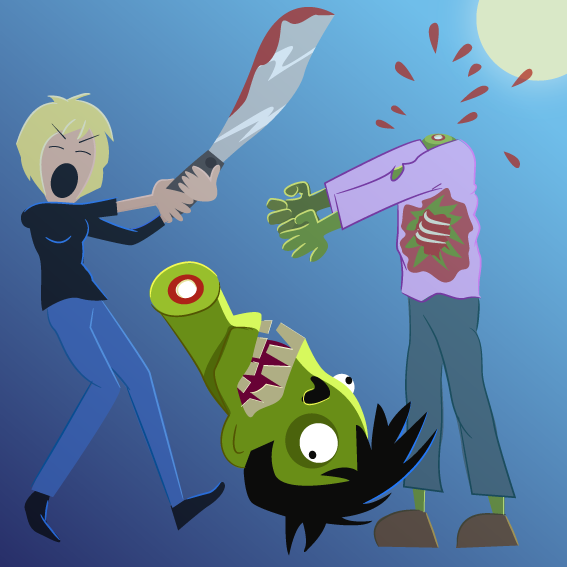 Projects include a spear head, simple knife, and a single edged 'cleaver' to add to your bug out kit. This program does not require any previous metalworking experience, and is of interest to anyone wanting to be truly prepared!. Course fee of $400 (+HST) all materials. Session limited to six students - (inquire about a group booking). This two and a half day, 18 hour session is intended for those interested in historical ironworking from the Viking Age. 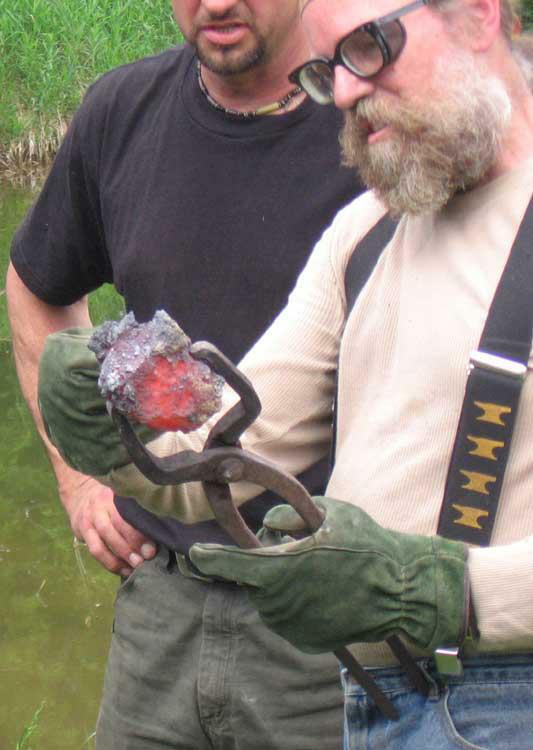 Friday evenings lecture portion will examine iron and blacksmithing related artifacts from the Viking Age, as well as discussing how iron was smelted from ore.
Saturday's hands on session will introduce students to basic blacksmithing process. 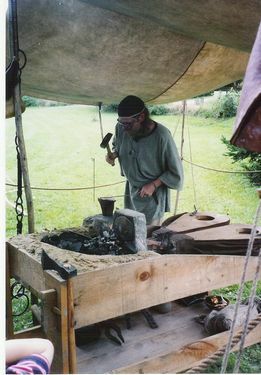 Working on modern equipment, several replica objects from the Viking Age will be made by each. Sunday work will switch to replica Norse charcoal forges and tool sets, continuing to make more objects. This program does not require any previous metalworking experience. Limited to four students, requires two firm bookings to run. Course fee of $450 (+HST) includes all materials and handout. For more details on this special program - go to Viking Course. 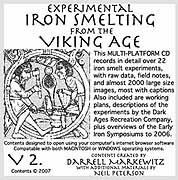 This 18 hour session will involve the student in the construction and operation of the 'Econo Norse' small scale iron smelter. It is the only program covering these skills available in Canada. Saturday will cover the theoretical and historical background of smelting iron: ores, furnaces, process, equipment as well as construction of the furnace, the preparation of charcoal and ore. A LONG day Sunday will start with pre-heating the furnace. The actual process of the smelt takes roughly 6 hours. After this, the resulting iron bloom will be extracted from the furnace, and given a primary consolidation. The iron produced will be cut to sections and shared between the participants. 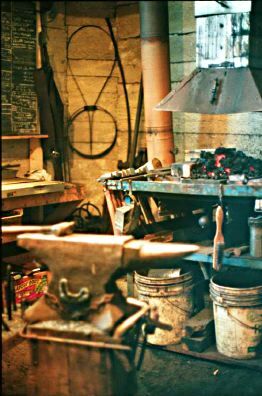 This program does not require any previous metalworking experience, and is of interest to students of history as well as blacksmiths. Course fee of $450 (+HST) includes all materials and handout (Students keep a share of the bloom created!). Session limited to three students. This is a one day / eight hour private session, working one on one with Darrell at the Wareham Forge. This session is primarily intended for specific 'project' work, with the participant making use of the facilities at the Wareham Forge, Darrell providing guidance and technical assistance. A Private Session may prove ideal for the starting student, especially one who needs closer supervsion than is possible in a larger group setting. The Private Session may suit someone who has a basic knowledge of blacksmithing, but is looking to expand their skills into a specific area - or just wanting to get a fast review. Some flexibility of dates possible, with some weekend dates and much more availability for mid week throughout the year. Base Fee is $300 per day (+HST), includes basic shop use (specific project materials extra). Please contact the Wareham Forge to discuss your requirements for course content and possible dates. Although intended for a single individual, and primarily as a working (rather than teaching) day, extra participants can be added to the 'Private Session'. The base cost remains $300 / day, with an extra cost of $100 / day for one additional person. No more than two students per session. There may be an extra amount for project materials / consumables. Scheduled as Arranged - August? Pending confirmation of project work in Scotland and Ireland. In total this would be a 5 day long, 8 hours working per day (total 40 hours). No previous experience required. Cost for this program would be $1500 (+HST). As with other programs, basic materials & fuels would be included, all tools and safety gear provided. If two people booked together, the cost would be $1000 + each. No more than two students (but would discuss this possibility). Dates would have to fit into my existing work commitments, available at the Wareham Forge only. Please contact me directly if this program is of interest to you. 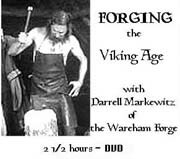 This is a two day / 16 hour private session held at the Wareham Forge, ideal for the small group who want to share their blacksmithing experience - at a reduced rate. Also suitable for a group that is looking to expand their skills into a specific area. Up to four students, each with their own work station (anvil and tools), each pair sharing a forge (coal or gas). Some flexibility of dates possible, with some weekend dates and much more availability for mid week throughout the year. Base Fee is $1400 + (+HST) for the group session with FOUR participants, includes basic materials. It is possible to expand to as many as SIX student work stations, add an additional $200 per extra individual. Please contact the Wareham Forge to discuss your requirements for course content and possible dates. Note that an individual group can book any existing program (on its scheduled date) together at this basic rate. This is a two day / 16 hour course, held at the facilities of your sponsoring institution (typically a museum or college). 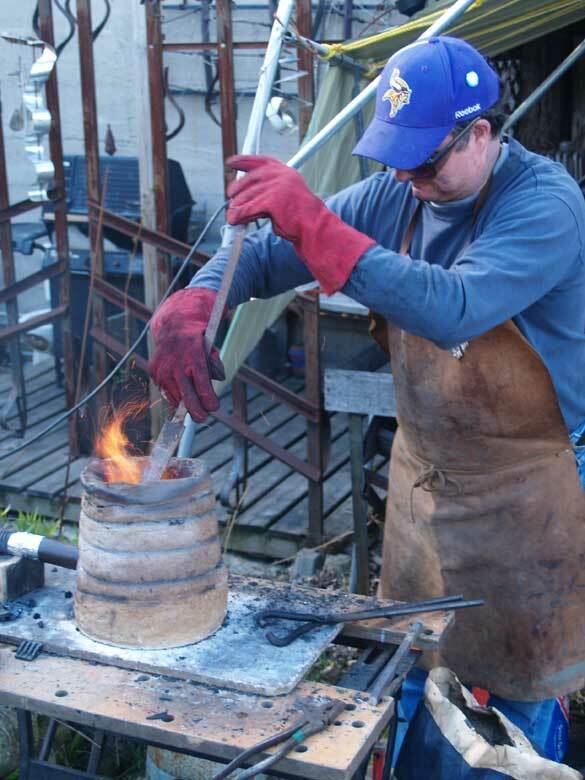 The Wareham Forge provides equipment to accommodate a total of FOUR students, each with their own anvil / work station, shared forge and associated equipment. Some ability exists to tailor the course materials to suit the individual institution (historic, artistic, basic skills). Base Fee is $1600 (+HST) for this group session, includes basic materials. (An extra travel amount applies if over 100 km @$0.55 / km from Wareham.) Please contact the Wareham Forge to discuss your requirements for course content and possible dates. One important core skill will be learning how to forge weld. More aggressive forging / forming methods of manipulating source bars will be undertaken. Specific attention will be given to various terminals, especially forming leaves. The basics of heat treating will be covered, through the production of simple punches. The possibilities of hot punching, both 2-D and 3-D, will be explored. Specialized / Modified tooling will be examined, as well as use of the air hammer. Expanding the design possibilities of hand forging into more complex, multi element objects, will be considered. .Course fee of $425 (+HST) includes all materials. Session limited to four students. For more details on this special program - go to Intermediate Course. This two day, 16 hour session will cover the basics of working with structural steels : PIPE / ANGLE / CHANNEL and more. The program will cover specialized tools, basic work with the air hammer, as well as design considerations. Requires a minimum of basic level experience, ideally intermediate level, please ask for details. Course of fee of $425 (+ HST) materials / handout / safety gear. Session limited to four students. For more details on this special program - go to Structural Course. This two day, 16 hour session will introduce the student to the basic techniques required in the creation of layered steels. Covers: alloy mixes, basic pattern generation and history. Each student will create a layered billet, plus will forge a small knife from a prepared block (provided). Requires intermediate level experience with basic bladesmithing (ability to forge weld plus effectively forge blade profiles). Course fee of $475 (+HST) includes all materials (includes a billet of pre-made material). Session limited to two students. For more details on this special program - go to Layered Steel Course. This two day, 16 hour session covers the building and operation of the small Aristotle Re-melting Furnace. This historic based, table top furnace, allows you to convert almost any iron based metal into a bloomery like material - with controlled carbon content. Ideal for blade makers wanting to produce ancient styled metals. On day one you will build your individual furnace (which you can keep), then run it through several production cycles. On day two, those metal cakes will be forged down to working bars. 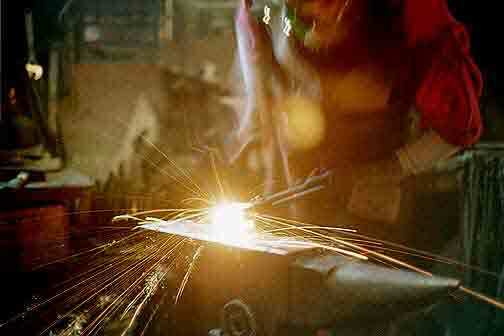 Students will get the most value from this course if they already understand forge welding technique. Course fee of $450 (+HST) includes all materials. Session limited to three students. For more details on this special program - go to Aristotle Course. Each student will be provided with 1 kg pieces of 'raw' bloomery iron. 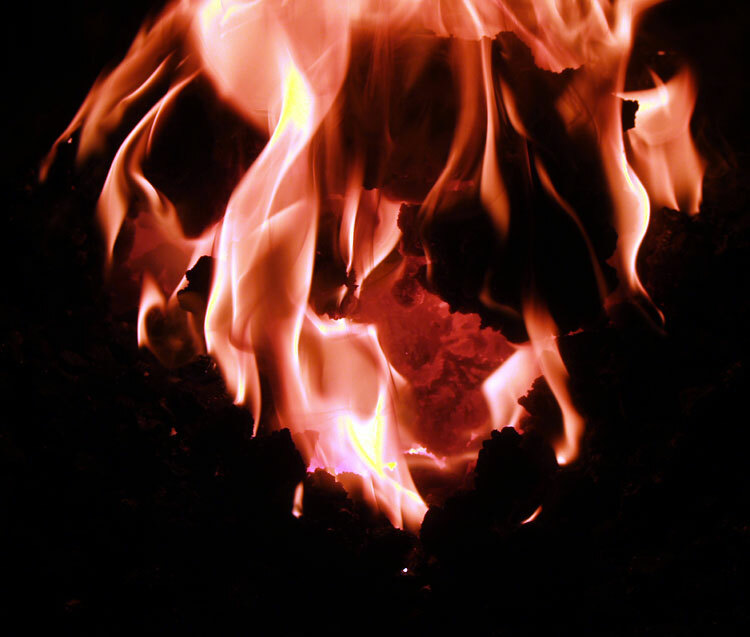 The course will not only cover the practical experience of compacting and forging these pieces into 'working bars', it will also cover the history and basic functioning of both the bloomery iron smelting furnace, but also the related Aristotle re-melting furnace. Requires intermediate level experience (ability to forge weld). See Course Requirements. Session limited to two students only. 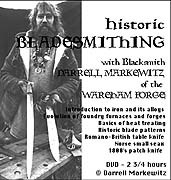 This unique program is of interest to students of history as well as blacksmiths. Course fee of $500 (+HST) includes all materials. For more details on this special program - go to Bloom Forging. This program does not require any previous metalworking experience. Session limited to four students. Course fee of $425 (+ HST) includes all materials. For more details on this special program - go to Metal Casting. - Basic safety gear (glasses and ear plugs) will be provided. Students may required to pay for any materials used for extra projects outside those for the established course outline. Discounts available for several people booking at one time. The Wareham Forge is located in the tiny Hamlet of Wareham, located about half way between Orangeville and Owen Sound. 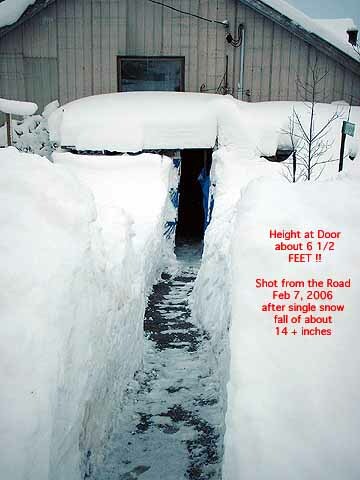 It is on a side road roughly three miles west of Highway 10, close to Flesherton. This makes it about 2 hours drive NW of Toronto, about the same distance from Kitchener. Upon registration, students will be sent detailed instructions and map to the studio. Any booking MUST INCLUDE FULL CONTACT DETAILS FOR THE STUDENT. 1) There will be NO REFUNDS if cancellation is attempted less than 30 days before the scheduled course date. 2) If you cancel a course booking, the refund situation will depend if I am able to confirm another possible student for the same program - taking YOUR space. 3) Any deposit refund is subjected to a loss of a 10% administration fee. 4) *IF* a replacement can be found, it may prove possible to transfer your booking to another later scheduled course date. 5) Bookings made as third person 'gifts' are subject to the same provisions. A specific course date MUST be given at time of booking. ALL provisions will be determined on a case by case basis. Each student should bring suitable clothing: leather work boots above the ankle, heavy cotton LONG pants and shirts (denim, flannel), and some kind of cap is suggested. 'Polar Fleece' or other synthetics are not allowed for safety reasons. Dependent on time of year, temperatures can range from about freezing, to high 20's C - so loose fitting clothing, consisting of several layers that will provide warmth and still permit movement, is suggested. Remember the forge is a dirty place! If students possess a personal forging hammer or other tools they are encouraged to bring them. A notebook is strongly suggested. Required safety equipment will be provided. Do not wear contact lenses. Each student remains responsible for their own lodgings, meals and snacks. Bringing a bag lunch is strongly advised. Although there are basic level restaurants available in both Dundalk in Flesherton, these keep limited hours. They are also at least 30 minutes back and forth from Wareham. Liquid replacement in the high heat of the forge is highly recommended, and your own fruit juice or pop should be brought. Remember the water here is drawn from a private well. Students may be allowed to camp on the one acre lot, using their own tents and other equipment. There is no additional cost for use of the space. This should be at best considered 'primitive' camping. There is a roofed fire pit and simple outhouse students can make use of. There is an outdoor cold water tap - no washing facilities. (Access to the interior home bathroom is not provided.) Although camping is free - please contact me well before your course date if you wish to camp in the yard. Dogs or other non student family members are only allowed with previous arrangement. There is NO EQUIPMENT PROVIDED. There is NO SUPERVISION outside scheduled course hours. A small bunkie type cabin is available for student rental. This is a simple insulated building, containing a standard double bed - you will need to provide your own sleeping bag or bedding. It plugs into the house power to allow for a single electrical outlet. Bathroom is the outhouse mentioned above. This 'Wendy House' is available on a 'first come' basis for rental to interested students, at a cost of $30 per night. All individuals are advised they should have read ALL the extensive information provided related to courses, requirements and potential students - BEFORE they contact me. A note on dates. 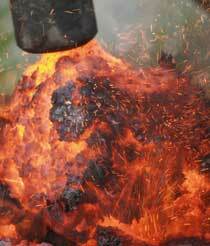 Due to increasing interest in Blacksmithing - course openings fill FAST. Due to past problems, bookings are not possible until the year schedule is finalized in late January.